The Samsung Galaxy Note 9's S Pen gained interesting new Bluetooth capabilities over previous versions of the same stylus last year. Now, the OEM has obtained a patent to pack a whole camera into a version of the same component. This camera has a tiny lens, but also has optical zoom and a battery to power it. Fans of the Samsung Galaxy Note series may list the original phablet line's S Pen among its most interesting and useful features. This was particularly the case last year, as the OEM incorporated Bluetooth support into the version of the stylus installed in each Galaxy Note 9 unit. This allowed it to handle such tasks as tracking its own phone and controlling presentations. They were improvements on the in-built accessory's former functions, which were largely restricted to drawing and writing on a Galaxy Note's screen in various different modes. It now appears that Samsung has a new trick for future generations of the S Pen. A patent granted yesterday (February 5, 2019) by the U.S. Patent and Trademark Office (USPTO) clearly outlines a smartphone stylus with an in-device housing and an on-board camera. This camera is shown as located in the 'clicky' end of the S Pen, where a tiny lens can capture light when the stylus is held upright or sideways. This light bounces along a series of internal reflectors placed within the stylus so as to reach an image sensor located about a third of the way down the accessory. Samsung even claims that this camera could have optical zoom, through adjustments of the initial lens. The diagrams for the newly patented design also accommodate a battery and a circuit board for the S Pen's new internal hardware. 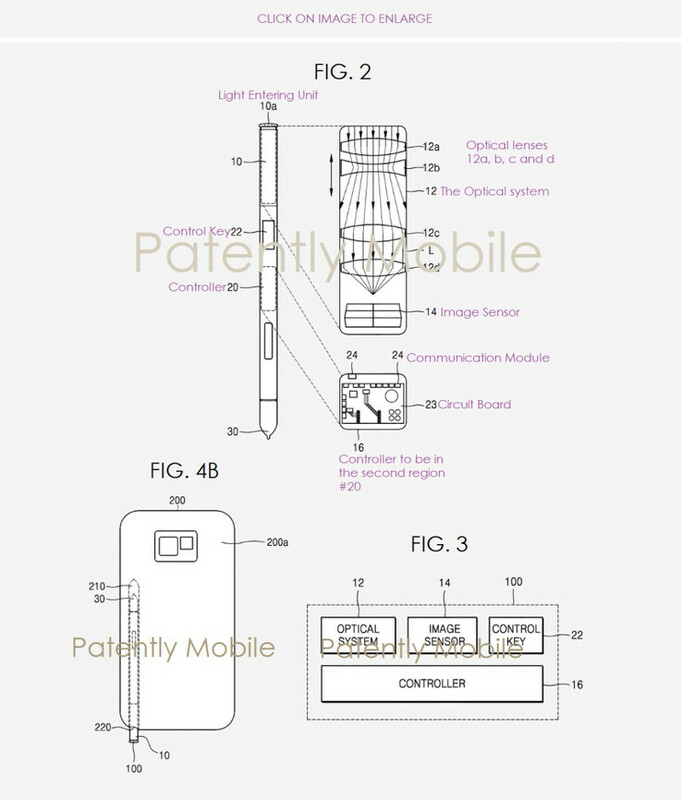 The patent indicates that the camera and its zoom function could be controlled either through a dedicated button on the S Pen, or on a paired electronic device (e.g. the Galaxy Note in question). Some privacy-conscious individuals may not be overjoyed with the idea of this new way to take photos using a Galaxy Note, replete as it is with potential for surreptitious image-capture. However, there is no guarantee that this feature will make it to the launch of the next generation of these devices, or indeed that it is specifically intended to work as a camera. Such an optical sensor could fill a number of alternative roles, including gesture-based control, general device input or even a new avenue of biometric identification.